More than 30,000 Iraqi security forces (ISF) personnel have been trained by Australian and New Zealand personnel from Task Group Taji since the Building Partner Capacity Mission commenced in 2015. Task Group Taji reached the milestone this week when around 900 personnel from the 57th and 61st Composite Brigade completed training. Commander Task Group Taji 6, Colonel Robert Calhoun, said the achievement was a testament to the hard work of 2,400 members of the Australian Defence Force and New Zealand Defence Force over the course of six Task Group Taji rotations. "We share great pride in the hard earned reputation that has been built by every rotation of TG Taji," COL Calhoun said. COL Calhoun highlighted the close relationship of Australian and New Zealand trainers and their Iraqi partner forces. "Our relationship with the ISF remains strong, and the men and women of rotation six recognise the importance of upholding this superb standing amongst our partners," he said. "In the nearly three years of this mission, we have been fortunate to work with some amazing leaders and soldiers who have been engaged in a fight of the utmost importance to their nation, and the rest of the world – their courage, their spirit and their sacrifice is recognised and immensely respected by our team here." Commander of Australian Defence Force personnel in the Middle East, Rear Admiral Jaimie Hatcher, said that over the past three years, Task Group Taji has trained forces involved in clearing and holding Mosul, securing Baghdad, and ongoing clearance and security operations in provinces across Iraq. "The operations to clear and hold places like Mosul, Tal Afar, Al Qaim and Hawija required the application of many of the skills that Australian and New Zealand troops have passed on throughout this mission," RADM Hatcher said. The training Task Group Taji provides includes weapons handling, marksmanship, explosive-hazard awareness, combat first aid, urban operations including building clearances, obstacle breaching techniques, vehicle checkpoints, combat leadership and the employment of joint fires. 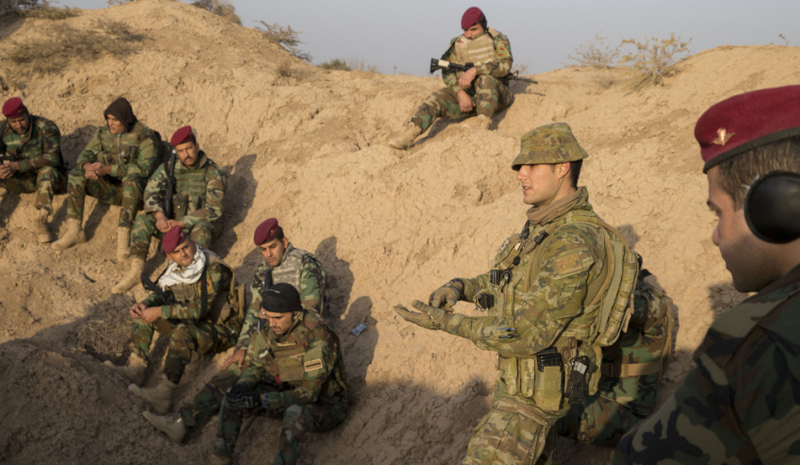 More than 300 Australian and 100 New Zealand military personnel are currently deployed to Iraq as part of Task Group Taji 6, providing training to ISF as well as ‘Advise and Assist’ support to the North Baghdad Operations Command.